Voyageurs National Park in Northern Minnesota is the 43rd site to be commemorated upon United States Quarters within the U.S. Mint's National Park Quarters series. 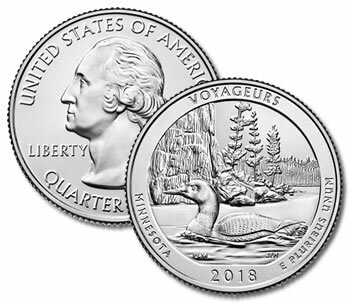 The design features a loon floating along one of the park's 4 lakes. Voyageurs National Park spans over 200,000 acres and is a wildly popular recreation destination throughout all 4 seasons.